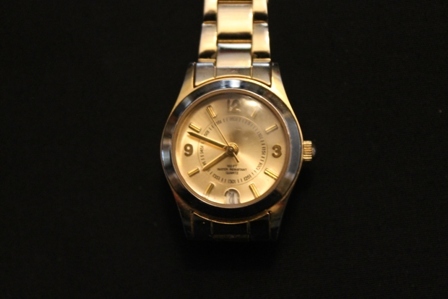 This goldtone round case bracelet watch is a fabulous addition to your fashion wardrobe. It has a solid strap with a classy gold face with an analog time display. This goldtone watch is powered by a reliable quartz crystal mechanism for accurate time-keeping. It is water resistant down to 10 meters. This womens watch is made of metal and has a polished finish. Batteries not provided.